You won’t believe it’s not butter…or any dairy for that matter! 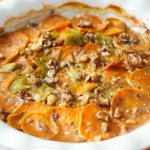 These healthy scalloped sweet potatoes are the perfect holiday side dish that everyone can enjoy! Holidays can be a tricky time for those with food sensitivities, or those serving others with food sensitivities. Gluten intolerance and lactose intolerance have received increasing awareness, making alternatives more readily available than ever before – but for many, the nostalgic foods associated with our favourite holidays are loaded with temptation – and ingredients that simply don’t agree with us! This lactose- and gluten-free sweet potato casserole tastes like a delicious update on the classic scalloped potatoes AND sweet potato casserole. Yet it is surprisingly made without milk, cheese or breadcrumbs! This healthy and hearty vegetable side dish is a great alternative to offer guests of varying dietary needs and is kosher and vegan on top of that! 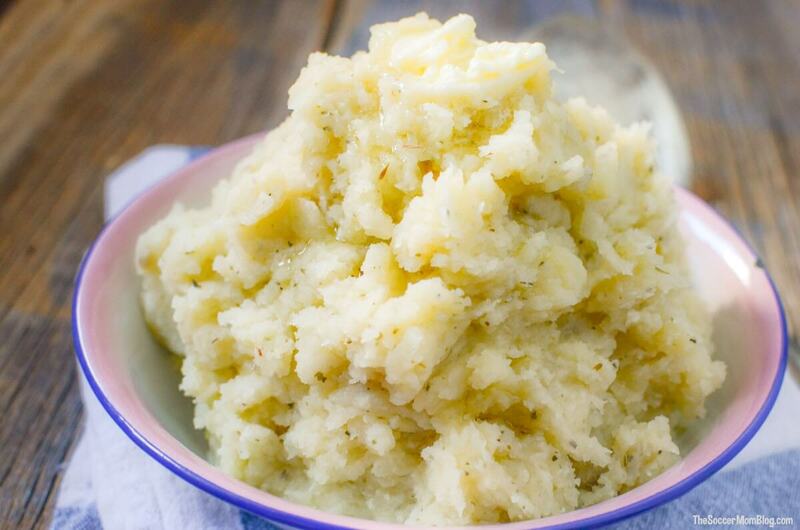 This is one side dish that everyone can agree on and enjoy. 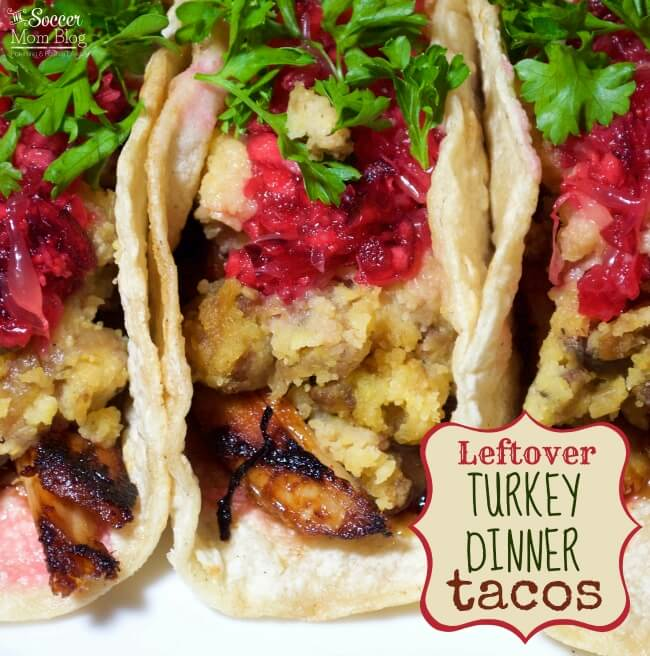 *Affiliate links are provided for your convenience in finding some of the supplies used in this recipe; disclosure policy available here. 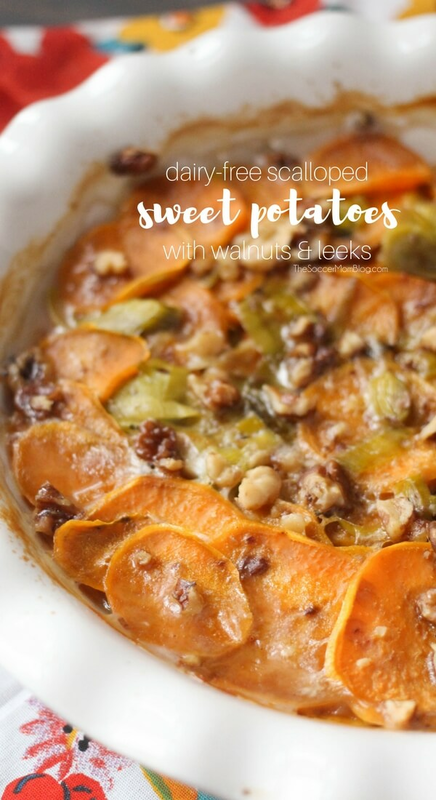 Free printable copy of this dairy free sweet potato casserole recipe available at bottom of post. 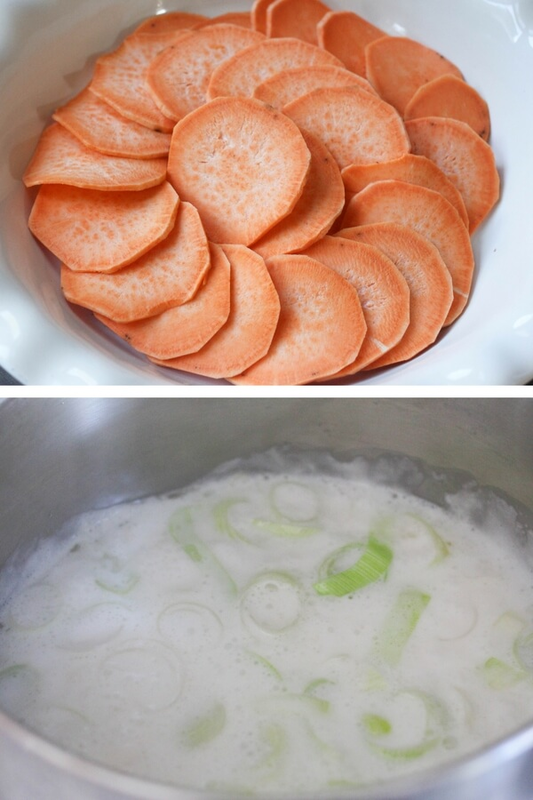 Peel sweet potatoes and slice to about 1/8″ – 1/4″ thickness (about the same as a slice of pepperoni) like shown above. 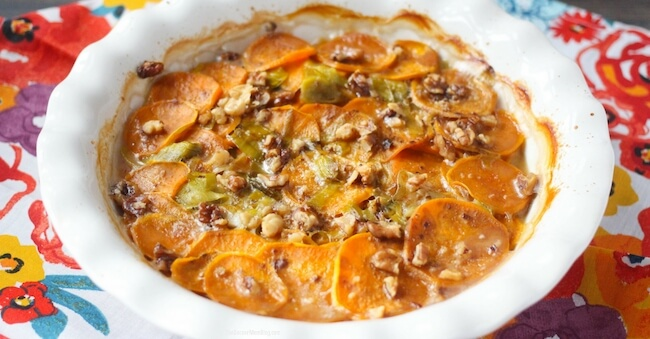 Layer sweet potatoes in an oven-safe casserole dish. Pro tip: A mandoline makes thin slicing a breeze! While sweet potato casserole bakes, add chopped pecans to a saute pan over medium heat. Add 2 Tablespoons mirin, stirring regularly. Cook for 3-5 minutes until pecans start to brown. Remove from heat and set aside. 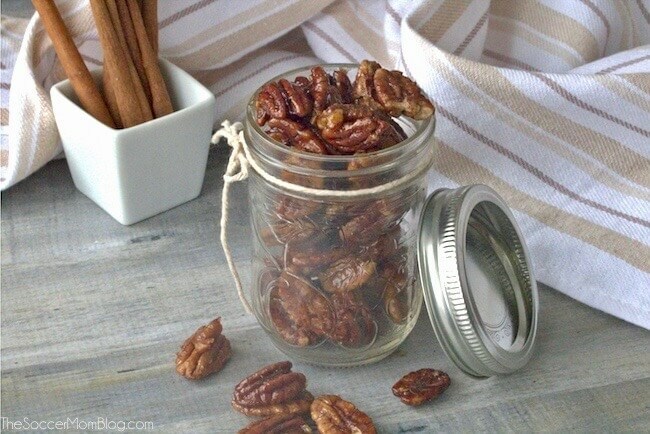 Our delicious (and easy) Paleo Candied Pecans are perfect for this recipe! They take only minutes to bake, so you can cook them while you’re prepping the sweet potatoes. You could also make them in advance. Related: Follow up your dairy free Thanksgiving dinner with a Dairy Free Pumpkin Spice Latte, our favorite Gluten Free Pumpkin Bread (Starbucks Copycat recipe). or this healthy pumpkin pie from Sugar Spice & Glitter. You won't believe it's not butter...or any dairy for that matter! 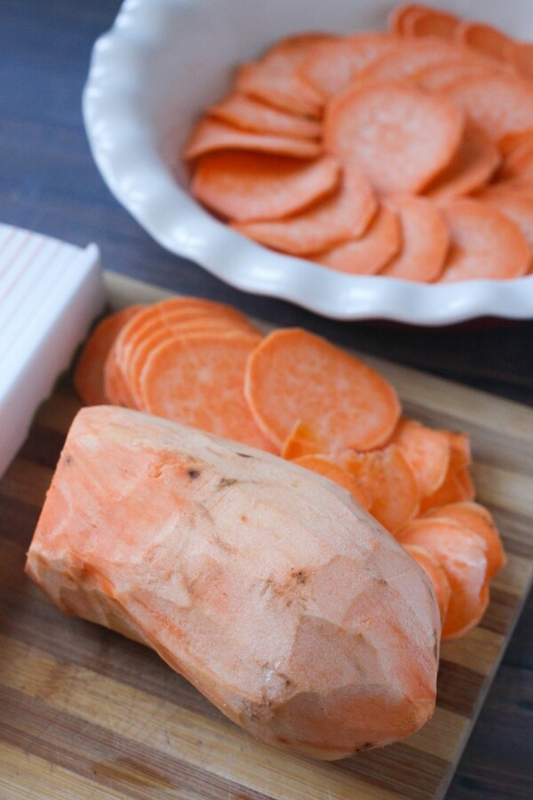 These healthy scalloped sweet potatoes are the perfect holiday side dish that everyone can enjoy! 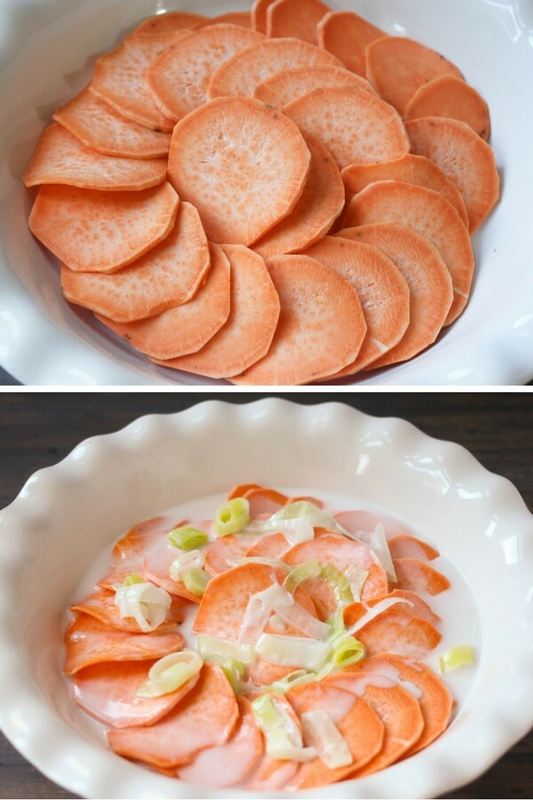 Peel sweet potatoes and slice to about 1/8" - 1/4" thickness (about the same as a slice of pepperoni). Layer sweet potatoes in an oven-safe casserole dish. Bake for 45 minutes - 1 hour at 350°F.